Sudha and Anju aren't sisters by blood, yet in the true sense of the word, they're sisters and more. Raised in the same house by their widowed mothers, the girls grow up believing that they're cousins. To say that they cannot live without each other is an understatement and, by their actions, often prove that they love each other more than they love themselves. The beautiful Sudha has always dreamed of having a family, but only after college and once she's established herself as a designer. Studious Anju loves the literary classics. She wants nothing more than to run the family bookstore once she's completed her degree. Love and marriage are for the beautiful people like Sudha, all Anju needs is books and enough money to remove some of the stress her mother has carried on her shoulders for so many years. But as the saying goes, "the best laid plans of mice and men go astray," and neither Sudha nor Anju finds herself leading the life she'd planned. Misunderstandings and a lack of communication drive a wedge between the formerly inseparable sisters. Unbeknownst to them, the fracture in their symbiotic relationship affects all of their decisions, ultimately leading them to conclude that without their other half, their lives are incomplete. 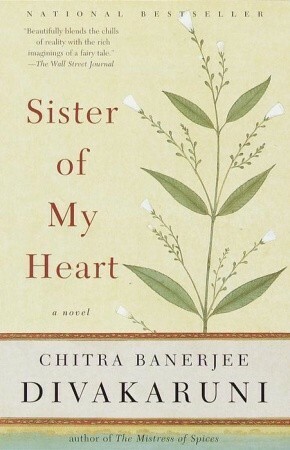 Sister of My Heart is a beautiful tale of friendship. It was heartbreaking to see the two struggle for so long needlessly. Sudha spends her life trying to right wrongs she believes her father did to Anju's father. Anju spends her adult years resenting Sudha for something Sudha can't control and is unaware of. The story has so many twists and turns, you won't be able to put it down until you're done.